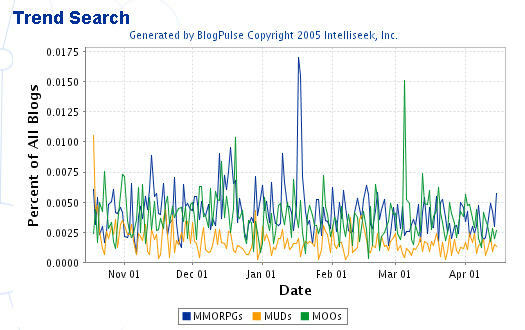 Unfortunately, the precision on the "MUD" and "MOO" queries is poor, because search is case-insensitive. The only query with good precision is MMORPG. That's whay you get such different results when you trend the plural forms. 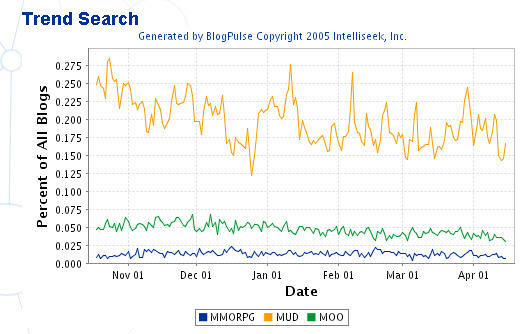 Looks like the precision of the plural form is good for MUDs and MMORPGs, but not for MOOs. Thanks, Natalie. Wow, you guys really are on top of the 'sphere, aren't you. The problem is with the bozos who came up with the name MMORPG. How am I supposed to do a word-of-mouth memecast on that? If they had chosen, say, Ajax, or RedSox, or something like that, we'd've long since buried MOOs.